The NGO Affair Bureau on Sunday, May 2, 2004, filed a case against 12 Proshika staff including its President Qazi Faruque Ahmed, accusing them of financial irregularities. And if one tallies the number of time the present government has accused the organisation of financial irregularities, one runs the risk of losing count. When the newly appointed Director General of NGO Affair Bureau Mizanur Rahman grounds a fresh accusation on "misused funds of an approved project" the actions and abuses of the Government and the Bangladesh National Party cadres unfold a different scenario. For the staffs of Proshika, it has been a long haul keeping a tenuous hold on their existence since the coalition came to power, who, it seems, is out to shake the very foundation of Proshika. "You can say, since the day the Jubo Dal, the youth wing of BNP, led by SA Khaleq, lay siege to the Prishika head office in Mirpur, all the regular programmes came to a halt," says a Proshika official. On April 18, 2004, the dreadful day of the siege, Jubo Dal gave an ultimatum to the government to cancel the registration of Proshika and to arrest the chief Kazi Faruque. From that day on, the number of attending stuff has seen a nosedive. "Attendance was 30 per cent on the first few days after the siege; it was not until last Thursday that it raised to 60 per cent," recounts an official. The recent filing of cases against 12 staffs including its president Kazi Faruque Ahmed and the arrest of a contingent of staff of one of the biggest NGO of the country seem to put a big question mark on democratic governance. Apparently it is the alleged antigovernment activities that made Proshika a target. But, when the DG of NGO Affairs Bureau says that he does not know about the allegation of Proshika playing an antigovernment role, and the home ministry sources confirm to the journalists that the government will continue operation to unearth the NGOs antigovernment activities and sedition charges may be pressed against it, the case cuts a different groove. One must remember that the same government earlier filed sedition charges against two Proshika officials and the High Court acquitted them. A newspaper report on May 6, says that the government is out to remove Kazi Faruque from his office and cancel Proshika's registration. The report confirms that more than 10,000 staff and 1.25 crore beneficiaries will be affected in the event of cancellation of the registration. The Proshika officials believe that it is the organisation's pro-liberation and anti-fundamentalist stance that brought on the wrath of the present government. The BNP and its allies, since the day they rode power, have launched a Proshika-bashing programme. The BNP with its hordes of young adherents in the Jubo Dal tried all sorts of things including ransacking, looting and battery to upset the organisation's activities. They succeeded in effecting the closure of many Proshika offices across the country. Proshika has 200 Area Development Centres (ACDs) strewn over 60 districts around Bangladesh. In a recent incident of looting and ransacking allegedly by the ruling party cadres left two of the ACDs in Barisal to lose valuables worth about Tk 20 lakh. The looters took away 11 motorcycle, TV, furniture, cash and other valuables while the staff of both the offices went into hiding. The witnesses let a Daily Star journalist know that at the ACD in Mehdiganj, Barisal, the attack was carried out by Md Mukhter and Md Sujan, respectively the convener of Jubo Dal and the general secretary of Jatiotabadi Chatra Dal, the stdent wing of BNP. Meanwhile the employees of the NGO are going through a tuff hurdle. "We were trying to continue with our regular programmes, but the arrest of the deputy director Abdur Rab and many others have brought everything to a stand still," says an employee. Rab and others were arrested on May 2, the day the people's cultural wing of Proshika was shut down. Police raided the Proshika headquarter twice, once on April 20 and again on May 2. The government, in their bid to gather evidence, will continue raiding the central and regional offices of the NGO. But, the question remains -- did they find anything to implicate Proshika with anti-government activities? The answer to this day is "no". 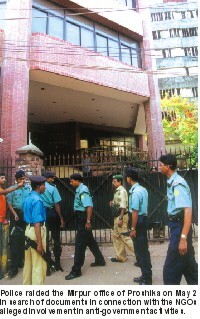 The Oficer-in-Charge (OC) of Pallabi Police Station Nurul Amin revealed to a Daily Star journalist that they have seized some official documents but the 'antigovernment discussion papers' are yet to be found. The police suspect this is the two-page paper that Proshika has distributed. When police stormed into the Proshika Pallabi Thana ACD, they were reported to have been swearing at the officials, asking for a piece of paper they said have originated from Proshika. Later, police claimed to have found it in the computer. The last item in the seizure list was this so called 'two-page antigovernment discussion paper'. The officials at the Pallabi ADC confirmed that the police themselves brought the paper, and they also forced five Proshika officials to sign a declaration "that officials were being forced to donate to Oikybaddha Nagarik Andolon", where Qazi Faruque serves as the member secretary. The statement also included a commitment on the part of the officials to testify against the NGO. However, police have denied any knowledge of such incident taking place during the raid. The arrests, the attacks and the accusations have succeeded in putting a moratorium on all Proshika activities. All in all, 72 staff were arrested within the month of April. It was all a package of vengeance fed by a conspiracy theory. The theory that this NGO is engaged in anti-government activities brewed a lot of ill-devised actions. Both the henchmen of the coalition government and the police kept hounding Proshika Manobik Unnoyon Kendra for, what the coalition government believes, aiding the main opposition Awami League. Meanwhile, police actions too has been inconsistent with democratic norms. The forceful extrication of 'confession' from Rab, the Deputy Director of the cultural wing, is a case in point. Police allegedly forced Rab to give confessional statement before a magistrate, which Rab later retracted. Police also arrested the President of ONA Harunur Rashid and forced him to give testimony of Proshika's anti-government role on camera. After it was televised, Rashid sent a statement from a hideout stating that police coerced him to say things that he did not mean or want to. The chain of events has more twists to it. An Inquilab report on April 30 said, "an amla (bureaucrat) mutiny was in the offing. And Proshika would have initiated it by bringing in lakhs of staff to lay siege to the secretariat had they were given the chance". It seems that the government bases its actions against a major NGO on similar baseless premise. The Proshika case got soured from the beggining. Last year the High Court issued a 'rule nishi' against freezing of Tk 135 crore allocated for a particular project of Proshika. The highest court in the country declared it illegal. Even the donors were concerned over freezing of a total of Tk 350 crore allocated for a number of organisations by the NGO bureau of the government. The standard procedure to clear such doubt about transfer of fund for a certain project is to conduct audit by internationally renowned companies. A famous international audit firm Price Water House Coopers have carried out audits in 2003 and cleared Proshika's name along withe other organisations. Yet, the government is unwilling to let go of the matter. It has orient itself to bring down Kazi Faruque and his organisation. But so far has failed to come up with any incriminating evidence. The hounding was launched after BNP and Jamaat came to power, and has been intensified since last year. The accounts of the organisation have also been freezed. Meanwhile, when many field workers are absconding from their home to avert police harassment, Kazi Faruque, who is in hiding since last two months or so, has challenged the government to prove its claims.